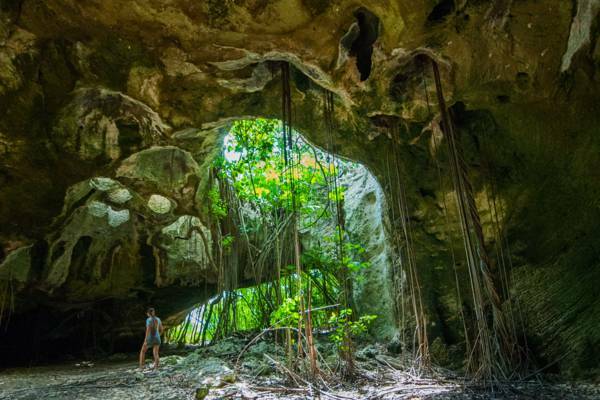 The Indian Cave, Middle Caicos. It’s definitely worth stopping here as the cave is found close to the main road into Middle Caicos. There’s no entrance fee. Please don’t deface the cave with inscriptions or graffiti. The main gallery at Indian Cave. 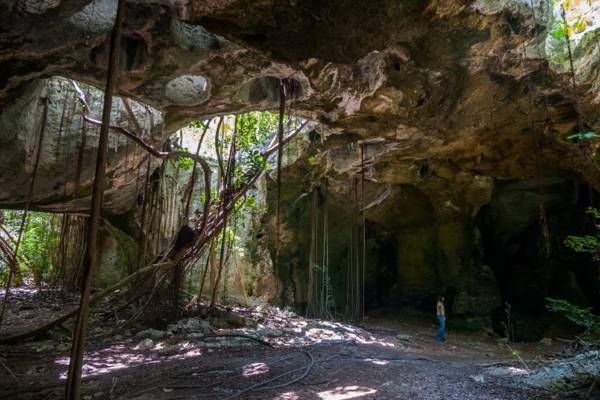 Found off the main road into Middle Caicos, Indian Cave is a large single gallery cave with many openings and skylights. Like nearly all sinkholes and caves found in the Turks and Caicos, Indian Cave was created by what is called the Karst process: the slow action of slightly acidic rain water dissolving the soft limestone as it drained to the water table. Indian Cave will delight nature enthusiasts. Barn owls, bats, Cuban crows, yellow crowned night herons and anis often visit the area, and giant blue land crabs make their home in the soft damp floor of the cave. Along with many native plants, papaya trees and the Short-leaved fig grow at this formation. Due to the ease of access and no entry fee, Indian Cave is definitely worth a quick visit. As with nearly all the caves and sinkholes in the Turks and Caicos, Indian Cave was formed over time by the Karst process of slightly acidic rain water dissolving through the surrounding limestone. Indian Cave has shown evidence of human habitation during pre-Columbus times, but it’s not really known if the cave was continually lived in or only used as a shelter during storms and for special purposes. Archeological digs conducted here in the late 1990s have revealed many interesting finds. Along with some shards of ancient pottery, bones and fossils of quite a few animals were uncovered, including an extinct tortoise and giant iguana, small reptiles, owls, parrots, hawks. 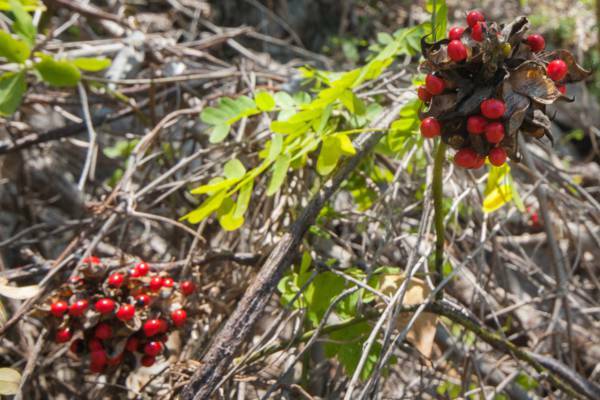 A type of plant with highly poisonous seeds, the Rosary Pea (Abrus precatorius), is found near the entrance to the cave. Ingesting the hard bright red seeds can be fatal, so avoid this small vine and take extra care when visiting with children. Rosary Pea (Abrus precatorius) is a very poisonous plant. Ingesting the hard bright red seeds can be fatal, so avoid this small vine and take extra care with children. Indian Cave is a protected area. Please don’t deface the cave with inscriptions or graffiti.